Sighted children have constant opportunities to visually compare and contrast items in their world. Creating opportunities to stimulate the brain to compare and contrast like objects is an important learning event for children with visual impairments of all kinds. But the opportunities must be provided as much as possible. Attribute trays are a great way to provide this access. The trays provide opportunities for children to build cognitive, language and tactile skills. They give children the necessary time for full exploration and give repeated opportunities to become familiar with everyday objects. Here is one example of an attribute tray about brushes. The brushes are attached to the pegboard with elastic so children will not drop and lose the materials. The elastic allows the material to be brought to the mouth for tactile exploration or brought closer for possible visual exploration. It builds object permanence as the child is taught to pull the elastic to retrieve the brush that has fallen off the tray edge. The child builds understanding of the variety of brushes in the world. They build concepts and experience the differences in size, shape, weight, function, sound created, temperature and texture. Most important of all, these trays provide meaningful stimulation to the brain to reduce self body play. 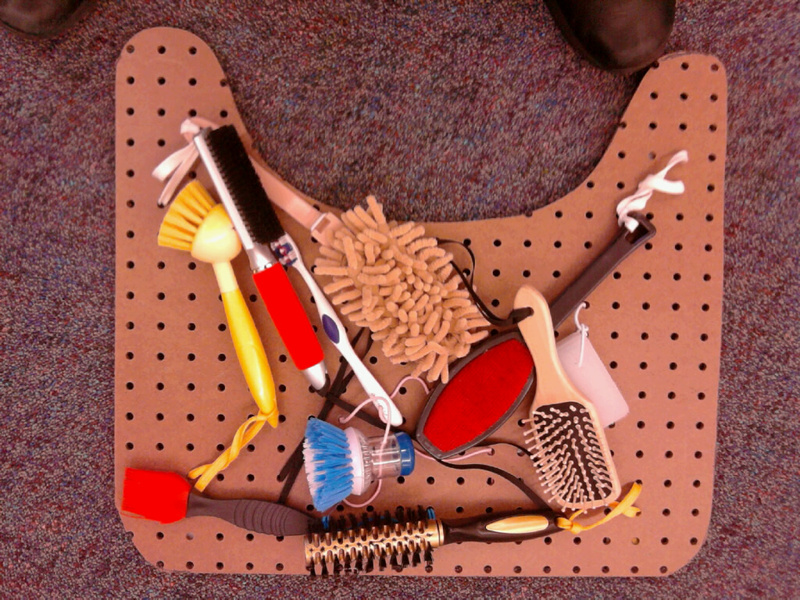 Trays of functional items to allow for expended exploration of items used daily. Bath materials: sponge, soap on a rope, washcloth. Children with CVI need Active Learning and specific considerations to ensure they develop complete concepts about the world. This is a cartoon that highlights the misconceptions that might develop without carefully taught, total exploration of concepts in the world. Each of these men with visual impairments experiences only part of “elephantness”. To the man at the tail, an elephant is like a rope. To the man at the leg, an elephant is like a tree trunk. To the man at the ear, the elephant is like a fan. Each is correct according to the limited tactile experience but all are developing a completely wrong concept about elephants. Teachers and parents need to ensure that the child with a visual impairment explore everything completely and in real form for complete and total access to the world’s information. Here are some great directions for building a play space littleroom from Wonder Baby on the Perkins School for the Blind website. This only one of many types that can be created. As sighted people, we need to let go of our concept of “good toy”. What is interesting to us is often cute, colorful and represents things we see in the world. I think about what captures my interest as I shop for my sighted grandniece. These are not very interesting to a child with a visual impairment. Close your eyes as you chose a toy. Is that cold, hard plastic duck engaging? Does that furry teddy bear feel interesting? The answer is often “no”. Now feel a set of metal measuring spoons. Not much of a toy to you but to a child with a visual impairment, the shape is fascinating. These spoons are different sizes that can be compared. The temperature is cold. The spoons react differently when you hold them in different ways. They make great sounds when the clack together and great sounds when banged on other surfaces. Now that’s a toy for a littleroom! When picking materials for the littleroom, close your eyes. Sound, sizes, texture, weight, temperature, and changeability are the qualities we want to look for. The concept of the little room was created by Lilli Nielsen. It is based on the Active Learning central idea that children with visual impairments need access to materials at all times at near to stimulate their minds to explore and compare. 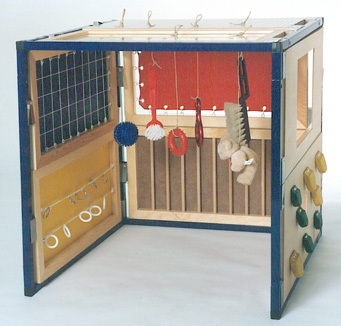 This access at near provides consistent tactile, visual and often auditory stimulation. Children in the little room explore without adult intervention. We always create little rooms to match children’s visual needs. Some children benefit from only red shiny items and not too many items (too complex). They might benefit from a white gauze cloth across the top (reduces complexity). Within this familiar environment children begin to reach to the predictable materials. Under the little room is a resonance board often made of birch. Movements create echoed sounds. I find children often increase vocalizations in this sound chamber. Children may need short exposures to this new environment in the beginning but by slowly increasing time in this play space, every child I have worked with loves this activity! When minds are stimulated, far less self body play is needed. Self body play is the child’s way to create stimulation for their brain. We want to decrease the need for this self body play and increase the child’s engagement with the world and the little room is the prefect way! Active learning all the time! Children who have typical vision have their brains stimulated by the visual scenes of trees, buildings, people and events they watch outside the window while riding in the car. They compare these scenes with what they already know, building valuable brain connections. What does your child see, touch and compare while in the car? Capitalize on this time by providing materials to look at, touch, activate and explore. You could use the sensory vest we discussed earlier this month. You could create a lap exploration blanket by sewing on drapery circles. Toys and materials can be tied on the lap blanket with elastic cord. Elastic allows the child to bring materials into their best field, drop them and find them easily. Create a visual play mat on the back of the seat in front of the child. Attaching elastic on a hair scrunch to the wrist then to the toy. These allows the child to experiment with speed of movement of their own movements connected to speed of sound with a visual consequence. Create an exploration belt with elastic cord attached to toys. This is precious learning time! Where are the child’s hands naturally? 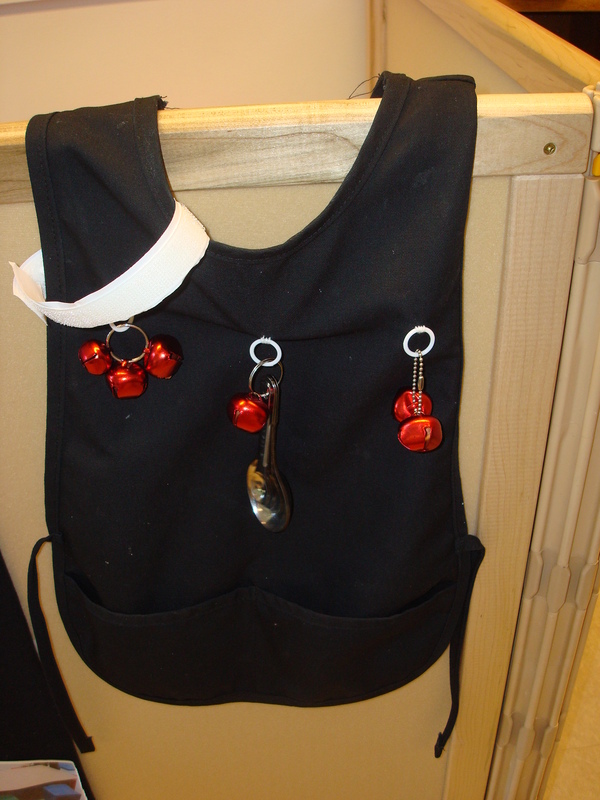 For the child whose hands are near their body, create a sensory vest. This is a purchased child’s cobbler apron. I sewed white curtain circles in various places under where the hands rest. I attached red bells on elastic cord. The child begins by accidentally touching then purposefully exploring to create the noise. Because the bells are attached with elastic, it can be pulled into view. Great practice for fine motor skills, tactile and visual skills. I like to make sure I create exposure to all kinds, sizes, weights and materials (wood, plastic, metal). This is active learning! The child can wear this an stimulate all the senses. True learning! I just love fish tanks to build visual attention. It provides access through many characteristics. I place the tank in the optimal visual field (visual field characteristic). I can position the child near the tank (distance characteristic). It is backlighted (light characteristic). It is moving slowly (movement characteristic). I can pick fish of highlighting colors (color characteristic). The fish stay in a confined area for long periods (latency characteristic). I can chose dark backgrounds, sand and plant life as a contrast to the fish or place a black cloth across the entire back and have fewer, larger fish(visual complexity characteristic). 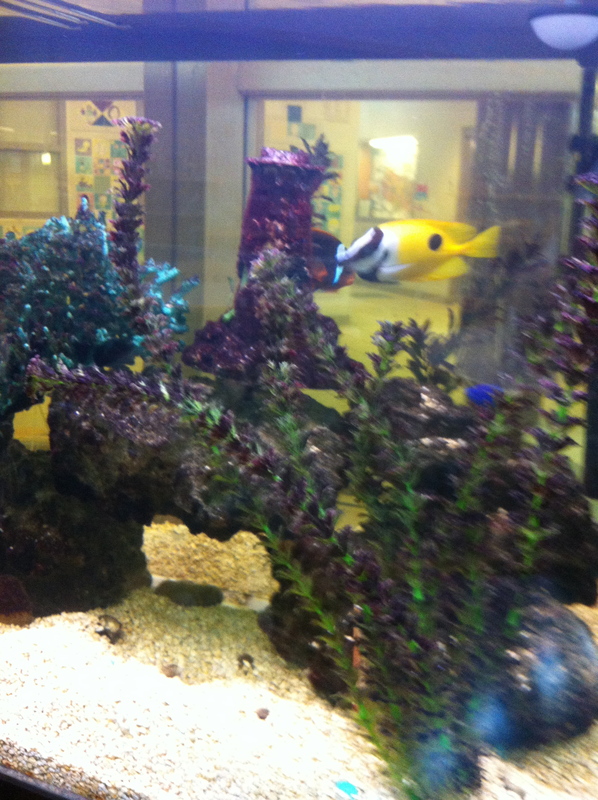 My students love this large yellow fish! Active Learning is a theory developed by Lilli Nielsen of Denmark. She had several blind brothers. She was a preschool teacher and psychologist who studied blind infants and children and their abilities to explore the space around them and to learn about the world. She believed that all children learn through play. They need opportunities to play actively instead of passively being stimulated by someone. Because the child is visually impaired, there are less opportunities to explore or to know what is out there to explore. She challenges us to create active learning spaces where a blind child can grow intellectually. Observe the child: We must know what a child can do and what he or she likes. Provide the child with more activities and objects that are similar to the ones he or she likes: He or she will be encouraged to explore them. Use real household objects, not just toys from the toy store. Give opportunities to practice and compare: When a child shows you he or she can use a toy or object leave it so they can compare the things they know with items that are new to them. We learn by comparing the new information with the old. An Example: When the child learns to bang, he needs lots of opportunities to bang different objects on different surfaces making different sounds. The child will repeat the action many times to learn it. Provide a few materials and activities that are slightly higher to challenge the child so they don’t get bored. When you present information to the child, you only model how to use the object or how to complete the activity. You do not expect imitation. Do not interrupt the child by talking to them while they are involved in Active Play: While the child is exploring and practicing a new movement, do not interrupt or make a comment. You can talk to the child when they stop to engage you. You can also wait for a little break to talk to the child. Talking to a child is very important but you must choose the right time. Slow down when you interact with a child: We must be patient and wait for a child to take a turn. When playing with the child give them time to explore the object alone instead of immediately showing the child how to use it. The overall philosophy is to have the child engaged with the environment as much as possible! There should never, ever be a time when the child is without something to look at and touch. Never!